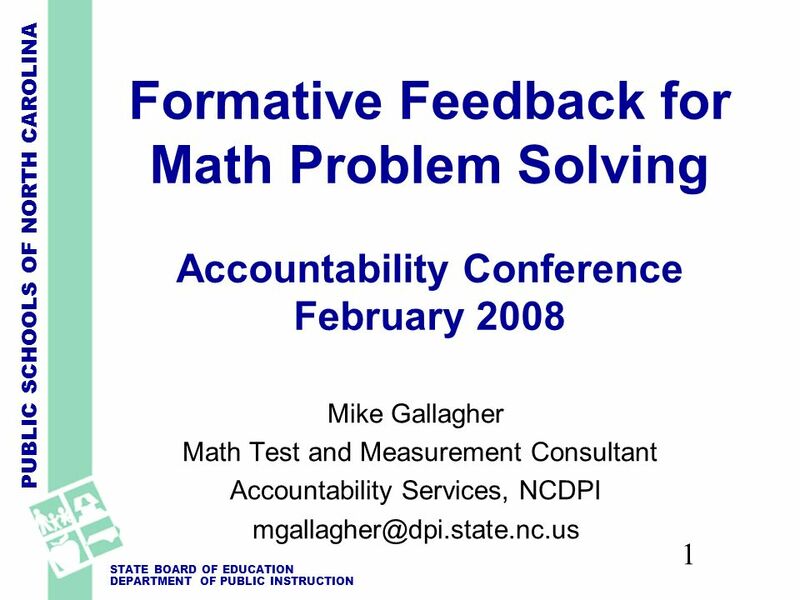 PUBLIC SCHOOLS OF NORTH CAROLINA STATE BOARD OF EDUCATION DEPARTMENT OF PUBLIC INSTRUCTION 1 Formative Feedback for Math Problem Solving Accountability. 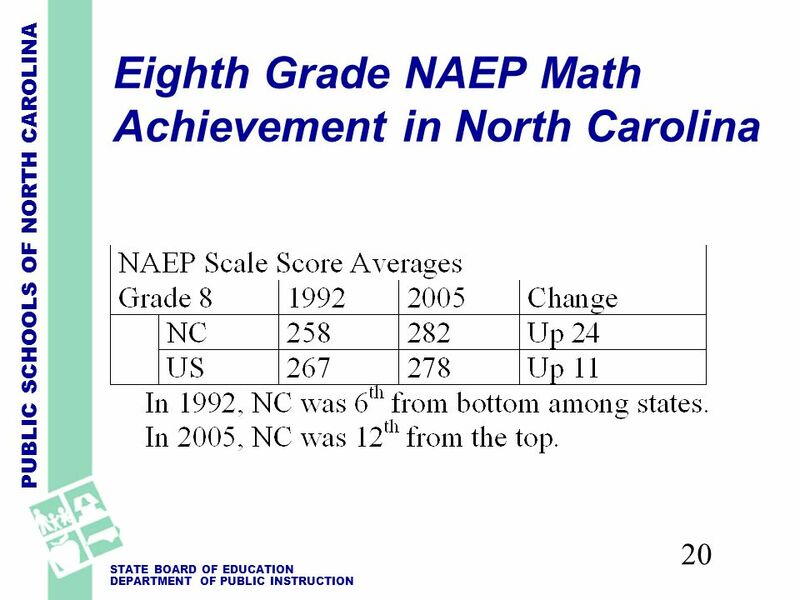 3 PUBLIC SCHOOLS OF NORTH CAROLINA STATE BOARD OF EDUCATION DEPARTMENT OF PUBLIC INSTRUCTION 3 Purposes Today Emphasize the importance of problem solving for students now and later. 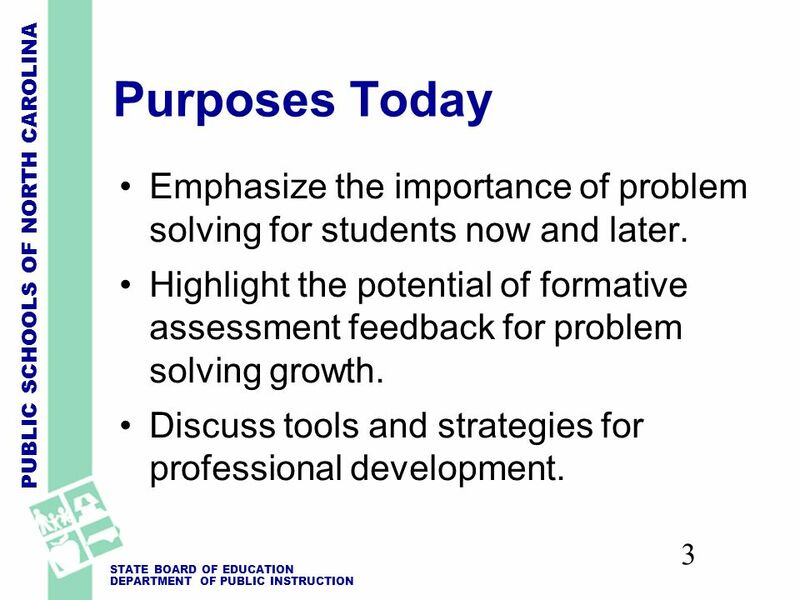 Highlight the potential of formative assessment feedback for problem solving growth. Discuss tools and strategies for professional development. 4 PUBLIC SCHOOLS OF NORTH CAROLINA STATE BOARD OF EDUCATION DEPARTMENT OF PUBLIC INSTRUCTION 4 2 Books of Note G. Polya... How to Solve It, the book is from the 1950s, but its stood the test of time. 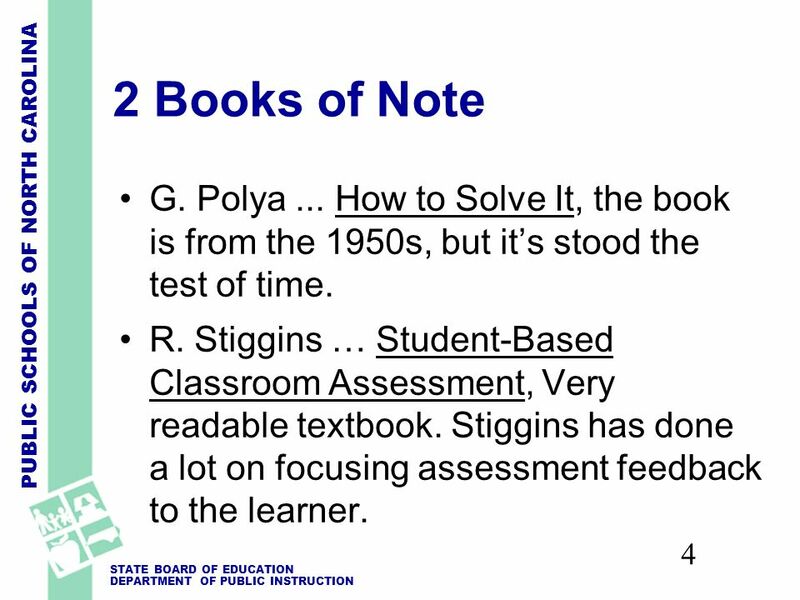 R. Stiggins … Student-Based Classroom Assessment, Very readable textbook. Stiggins has done a lot on focusing assessment feedback to the learner. 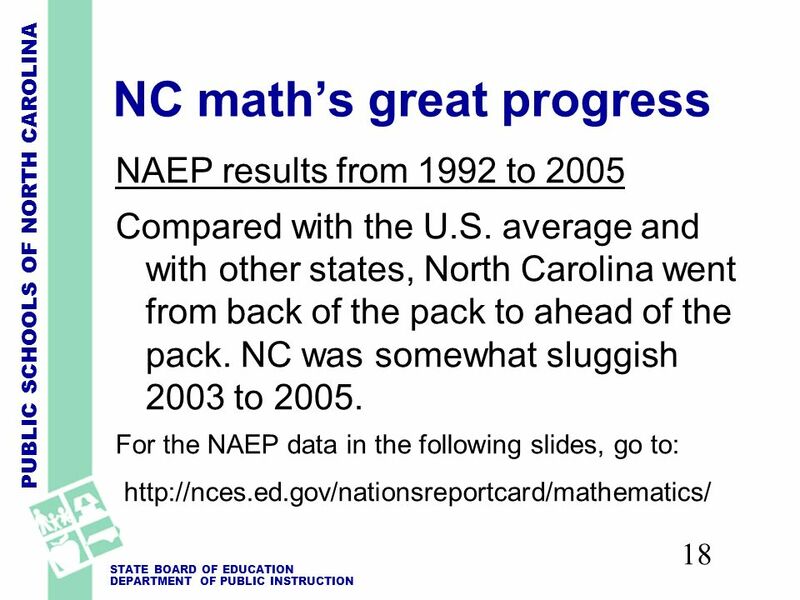 5 PUBLIC SCHOOLS OF NORTH CAROLINA STATE BOARD OF EDUCATION DEPARTMENT OF PUBLIC INSTRUCTION 5 NC Curriculum (Math 2003SCS) emphasizes problem solving Problem solving and reasoning are stressed throughout the goals at each grade level and in every course. 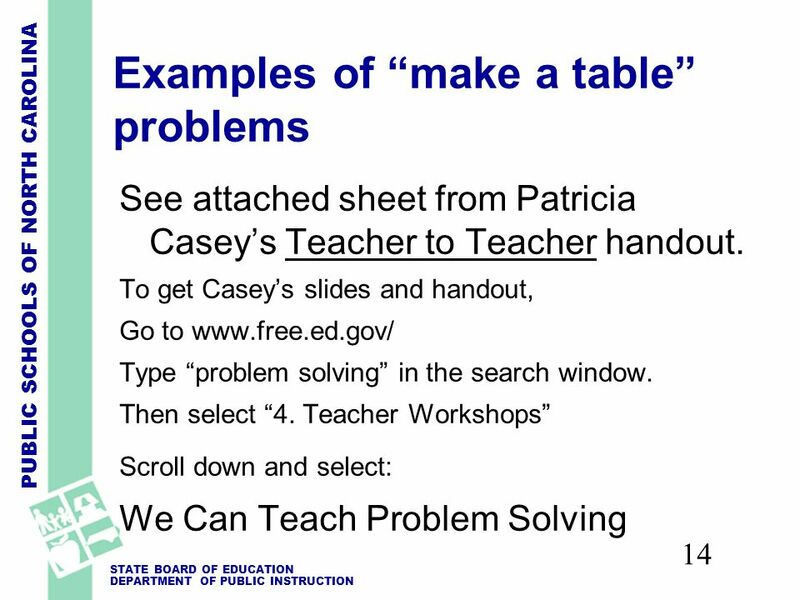 … Experiences in problem solving processes should permeate instruction. 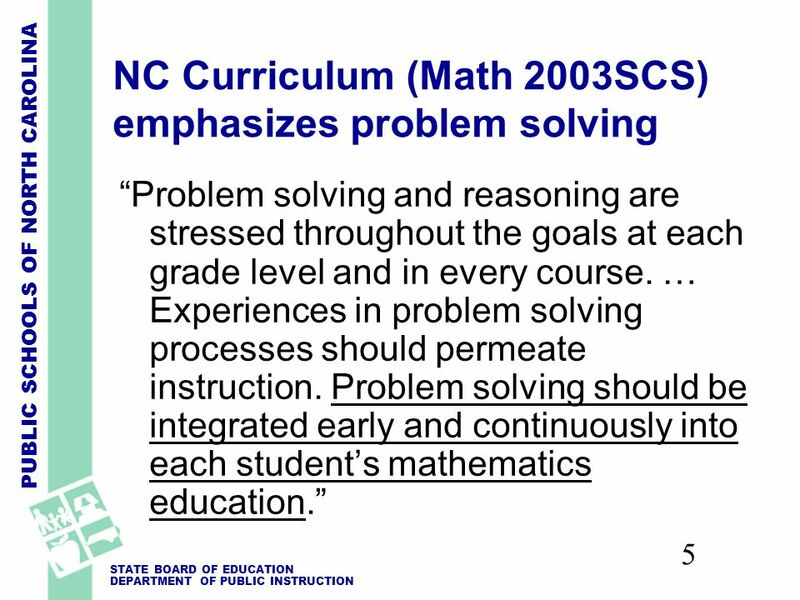 Problem solving should be integrated early and continuously into each students mathematics education. 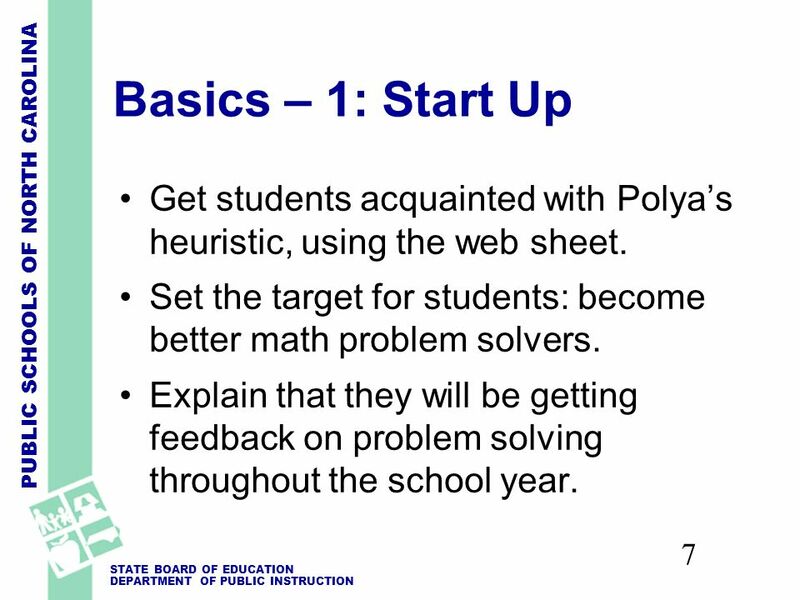 7 PUBLIC SCHOOLS OF NORTH CAROLINA STATE BOARD OF EDUCATION DEPARTMENT OF PUBLIC INSTRUCTION 7 Basics – 1: Start Up Get students acquainted with Polyas heuristic, using the web sheet. 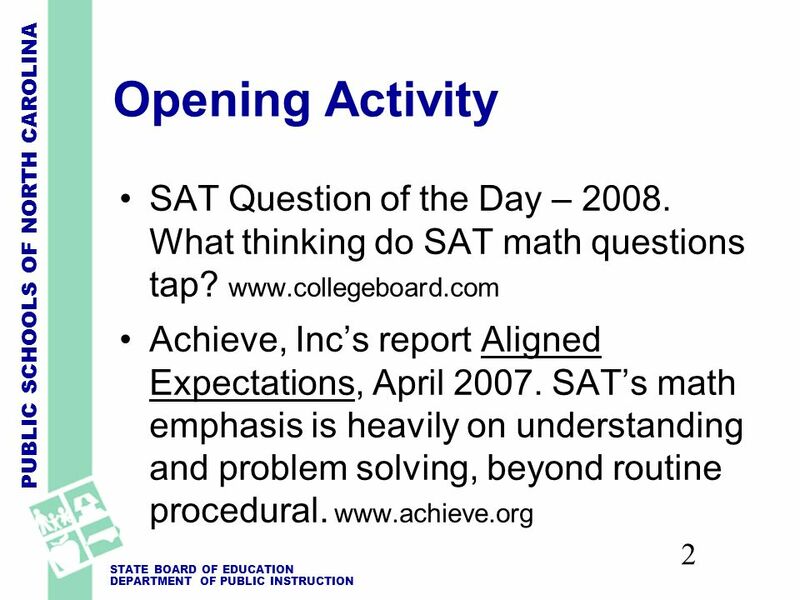 Set the target for students: become better math problem solvers. Explain that they will be getting feedback on problem solving throughout the school year. 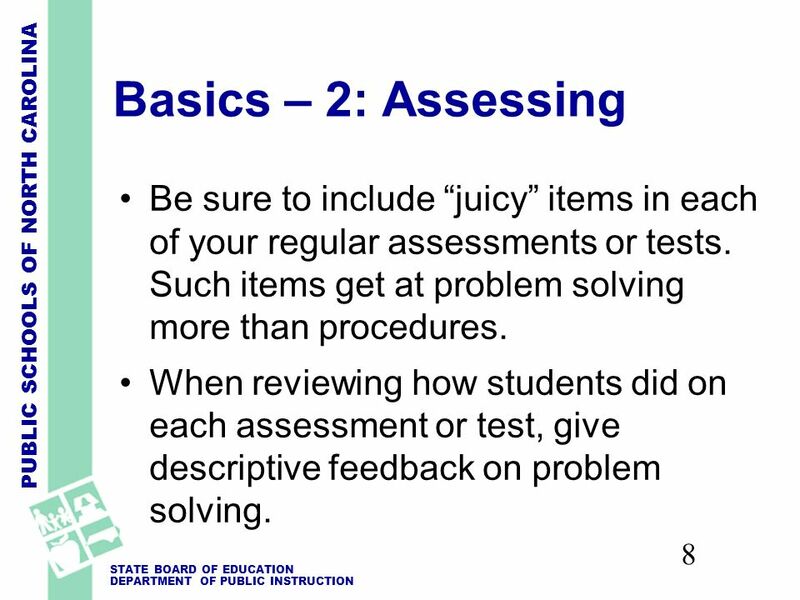 8 PUBLIC SCHOOLS OF NORTH CAROLINA STATE BOARD OF EDUCATION DEPARTMENT OF PUBLIC INSTRUCTION 8 Basics – 2: Assessing Be sure to include juicy items in each of your regular assessments or tests. Such items get at problem solving more than procedures. When reviewing how students did on each assessment or test, give descriptive feedback on problem solving. 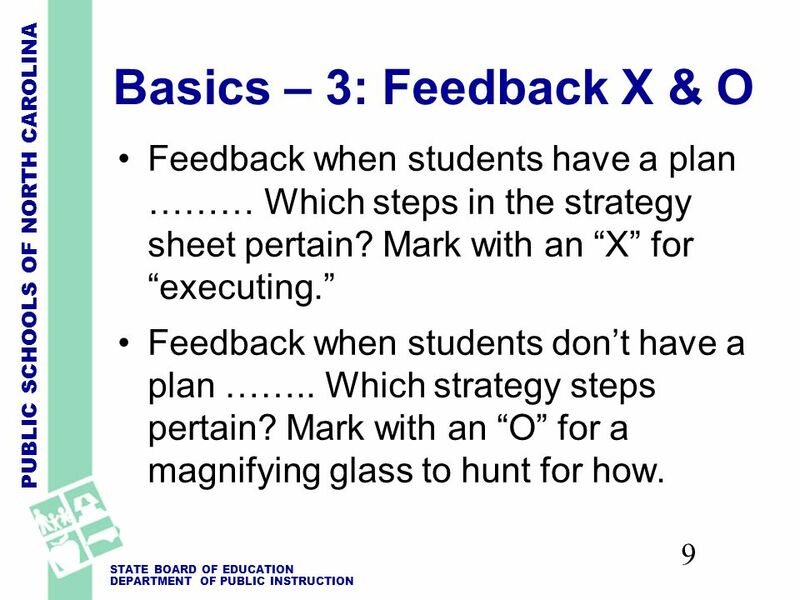 9 PUBLIC SCHOOLS OF NORTH CAROLINA STATE BOARD OF EDUCATION DEPARTMENT OF PUBLIC INSTRUCTION 9 Basics – 3: Feedback X & O Feedback when students have a plan ……… Which steps in the strategy sheet pertain? Mark with an X for executing. Feedback when students dont have a plan …….. Which strategy steps pertain? Mark with an O for a magnifying glass to hunt for how. 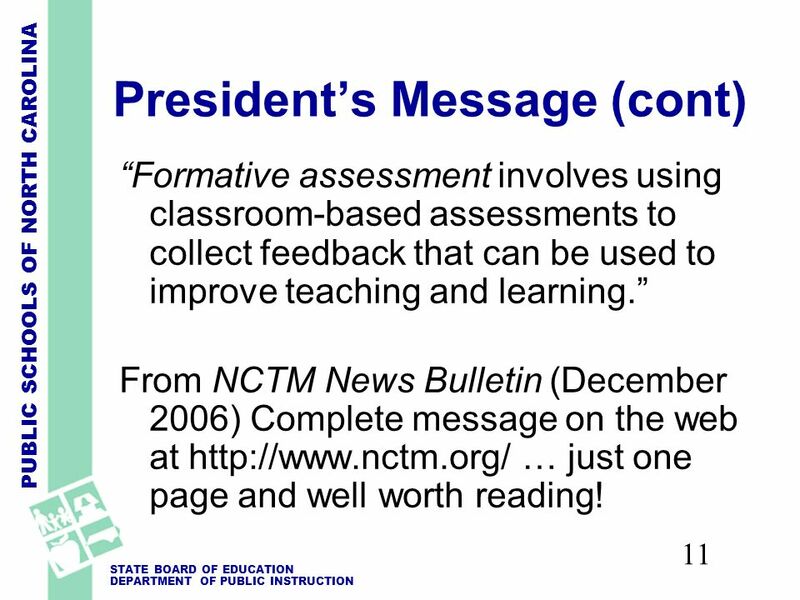 11 PUBLIC SCHOOLS OF NORTH CAROLINA STATE BOARD OF EDUCATION DEPARTMENT OF PUBLIC INSTRUCTION 11 Presidents Message (cont) Formative assessment involves using classroom-based assessments to collect feedback that can be used to improve teaching and learning. 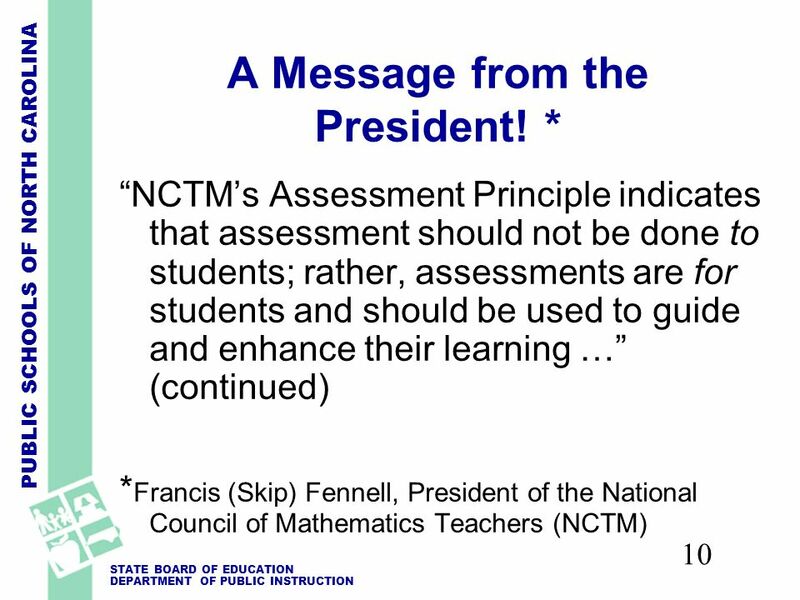 From NCTM News Bulletin (December 2006) Complete message on the web at http://www.nctm.org/ … just one page and well worth reading! 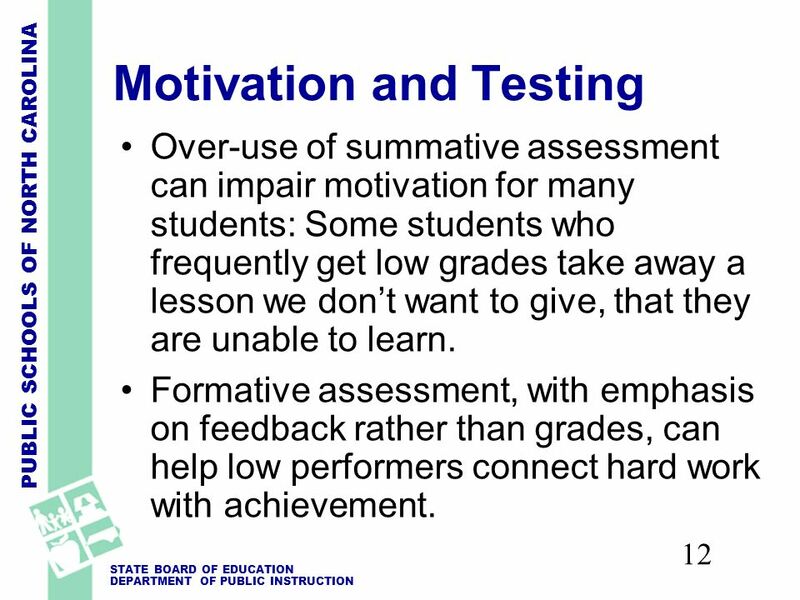 12 PUBLIC SCHOOLS OF NORTH CAROLINA STATE BOARD OF EDUCATION DEPARTMENT OF PUBLIC INSTRUCTION 12 Motivation and Testing Over-use of summative assessment can impair motivation for many students: Some students who frequently get low grades take away a lesson we dont want to give, that they are unable to learn. 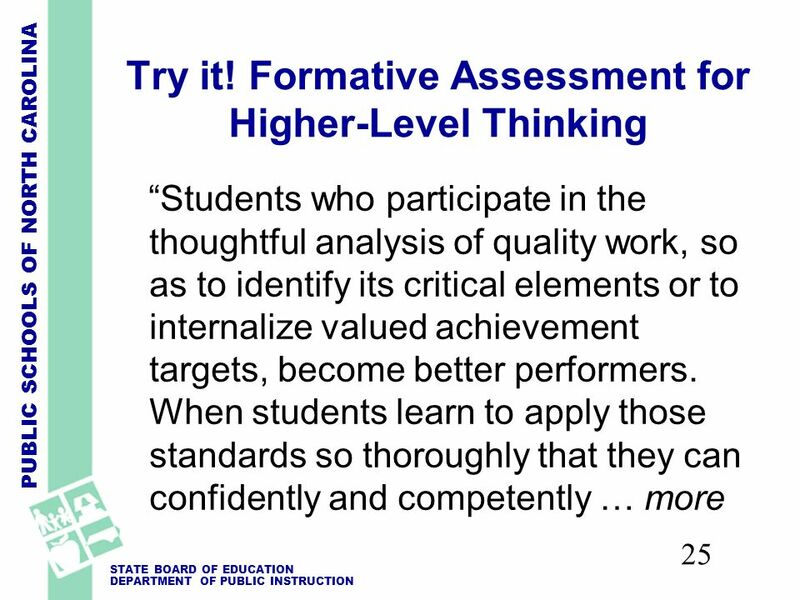 Formative assessment, with emphasis on feedback rather than grades, can help low performers connect hard work with achievement. 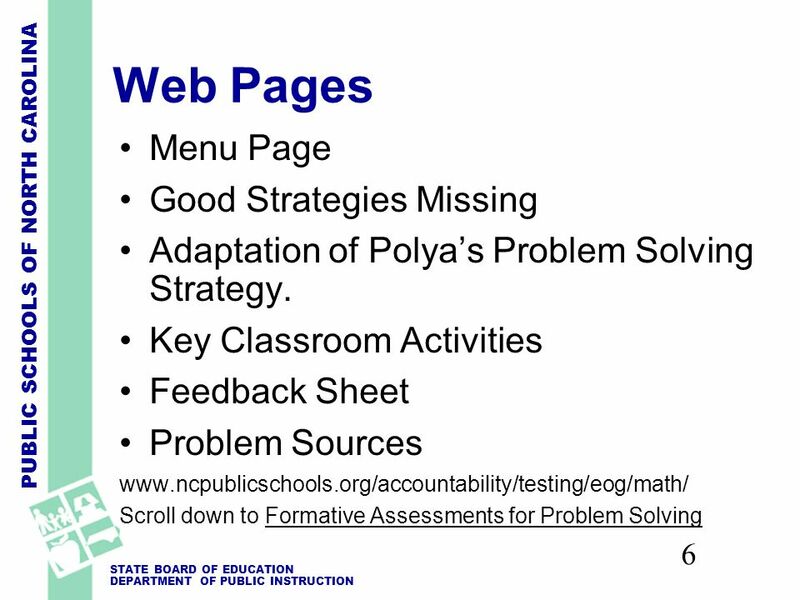 13 PUBLIC SCHOOLS OF NORTH CAROLINA STATE BOARD OF EDUCATION DEPARTMENT OF PUBLIC INSTRUCTION 13 Beyond Basics -> Planning to teach students to MAKE A PLAN Students need to spend some time on each Polya approach to finding a plan. (These are the Os on Slide 9) For example, what are some problems for which Make a Table will help? Work on those problems for a week or two. 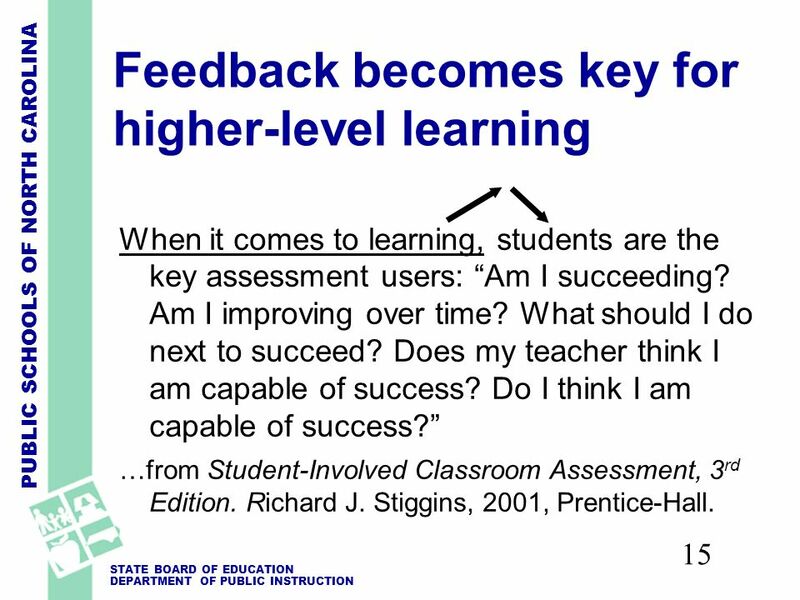 15 PUBLIC SCHOOLS OF NORTH CAROLINA STATE BOARD OF EDUCATION DEPARTMENT OF PUBLIC INSTRUCTION 15 Feedback becomes key for higher-level learning When it comes to learning, students are the key assessment users: Am I succeeding? Am I improving over time? What should I do next to succeed? Does my teacher think I am capable of success? Do I think I am capable of success? 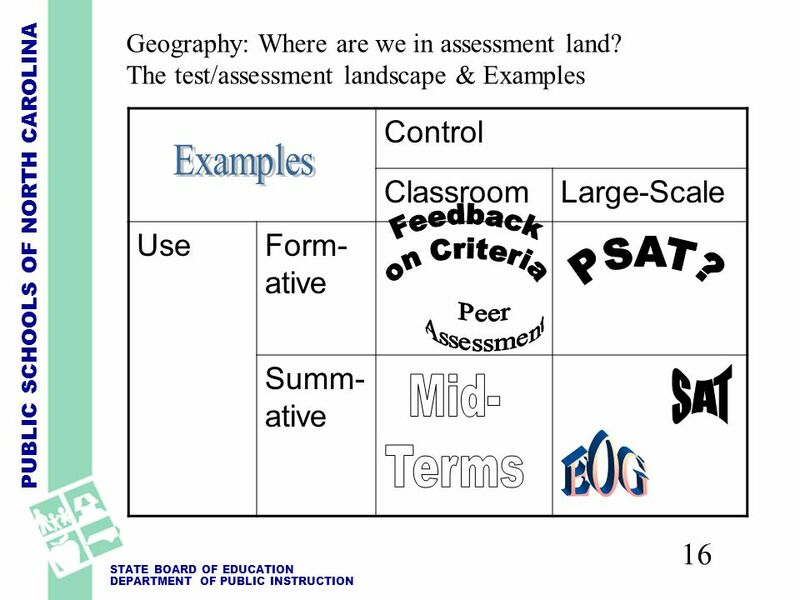 …from Student-Involved Classroom Assessment, 3 rd Edition. Richard J. Stiggins, 2001, Prentice-Hall. 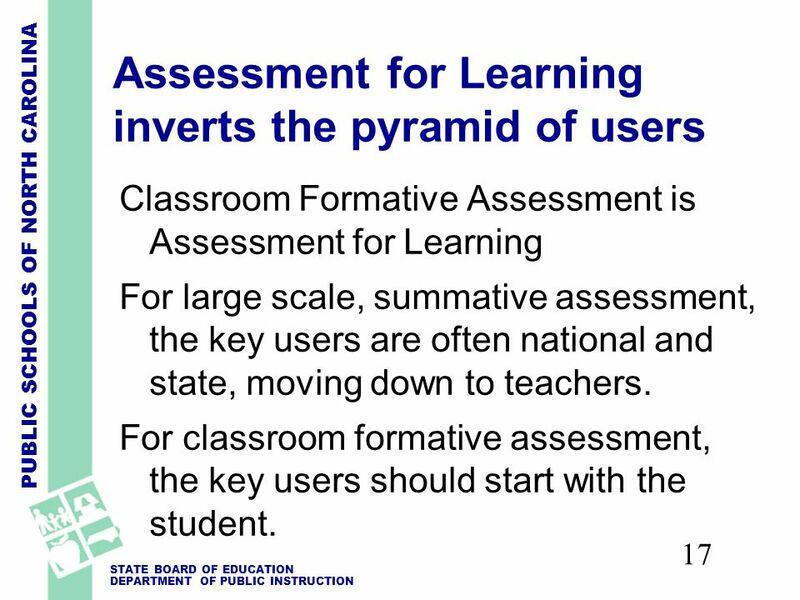 17 PUBLIC SCHOOLS OF NORTH CAROLINA STATE BOARD OF EDUCATION DEPARTMENT OF PUBLIC INSTRUCTION 17 Assessment for Learning inverts the pyramid of users Classroom Formative Assessment is Assessment for Learning For large scale, summative assessment, the key users are often national and state, moving down to teachers. For classroom formative assessment, the key users should start with the student. 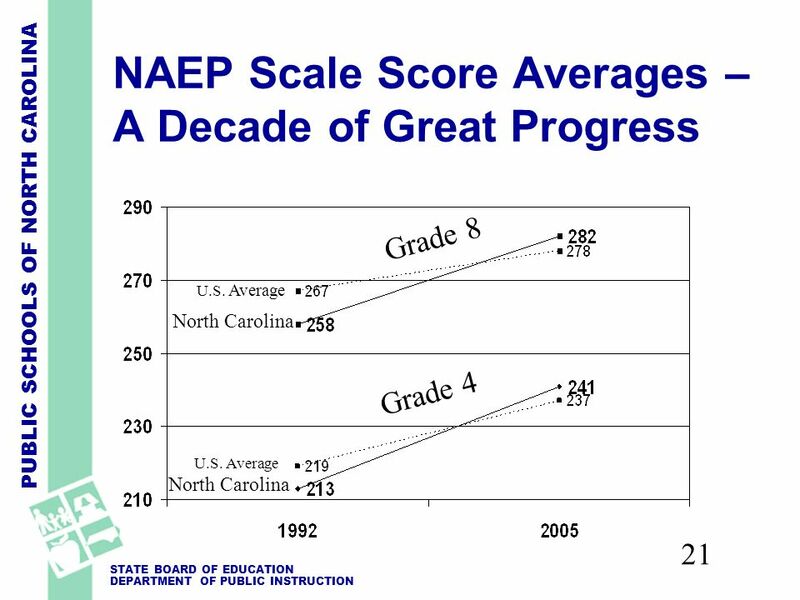 27 PUBLIC SCHOOLS OF NORTH CAROLINA STATE BOARD OF EDUCATION DEPARTMENT OF PUBLIC INSTRUCTION 27 Going Deep Paul Black & Dylan Wiliam, Assessment and Classroom Learning, Assessment in Education, Vol. 5, No.1, 1998, pp 7-71. This is a literature review. The teachers in these projects saw strong, positive effects, both in achievement and motivation, especially for students starting at lower levels. 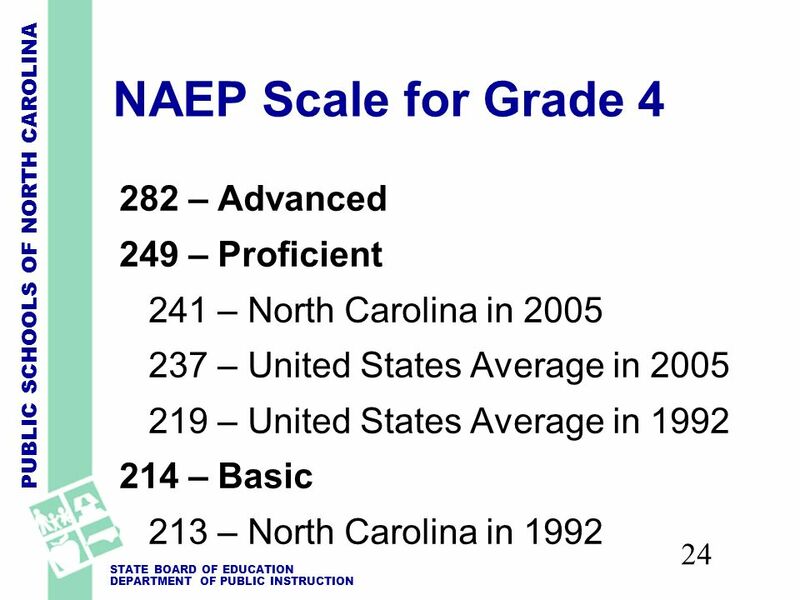 28 PUBLIC SCHOOLS OF NORTH CAROLINA STATE BOARD OF EDUCATION DEPARTMENT OF PUBLIC INSTRUCTION 28 Conclusion o Balance Assessment of Learning with Assessment for Learning. 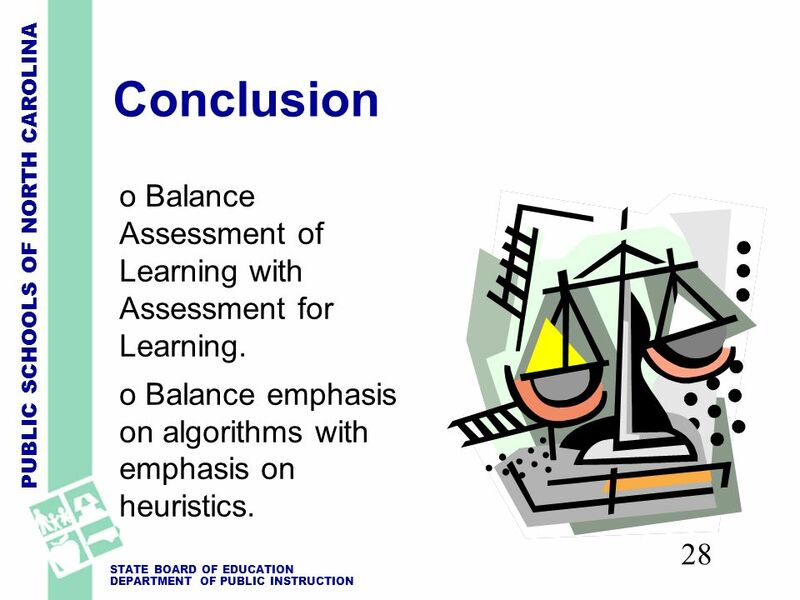 o Balance emphasis on algorithms with emphasis on heuristics. 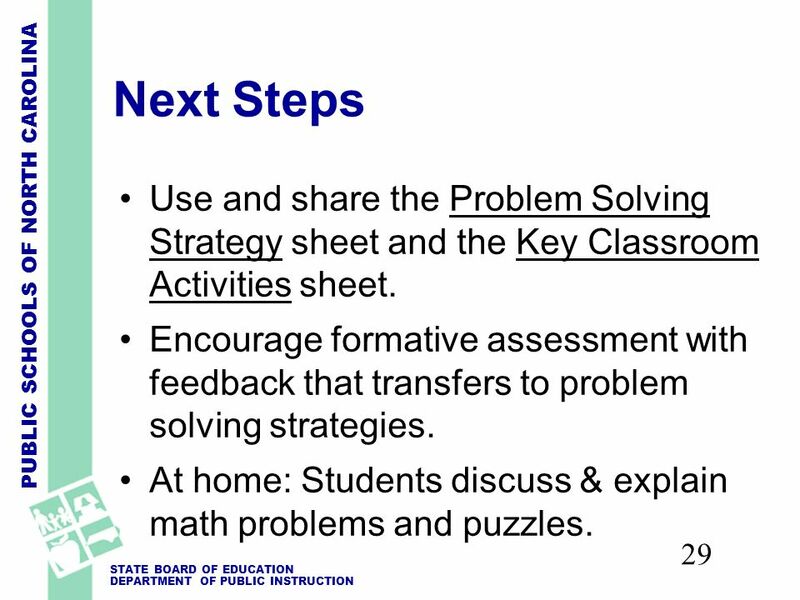 29 PUBLIC SCHOOLS OF NORTH CAROLINA STATE BOARD OF EDUCATION DEPARTMENT OF PUBLIC INSTRUCTION 29 Next Steps Use and share the Problem Solving Strategy sheet and the Key Classroom Activities sheet. Encourage formative assessment with feedback that transfers to problem solving strategies. At home: Students discuss & explain math problems and puzzles. 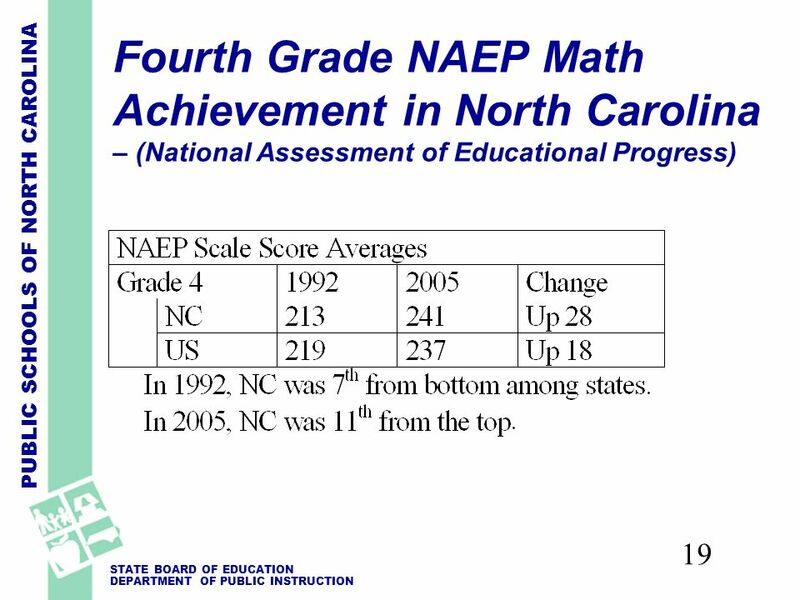 Download ppt "PUBLIC SCHOOLS OF NORTH CAROLINA STATE BOARD OF EDUCATION DEPARTMENT OF PUBLIC INSTRUCTION 1 Formative Feedback for Math Problem Solving Accountability." Copyright © 2008, Intel Corporation. All rights reserved. Intel, the Intel logo, Intel Education Initiative, and Intel Teach Program are trademarks of. North Carolina Department of Public Instruction Division of Accountability Services July 24, Hope Tesh-Blum Division of Accountability Services. 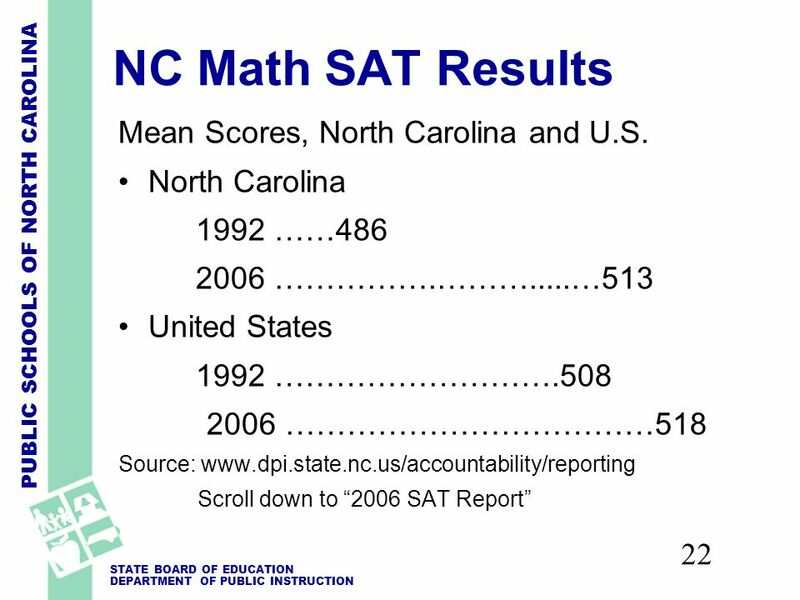 North Carolina Department of Public Instruction Division of Accountability Services/Testing Section September, Hope Tesh-Blum Division of Accountability. Classroom Factors PISA/PIRLS Task Force International Reading Association January 2005. Examining Student Work. Ensuring Teacher Quality Leader's Resource Guide: Examining Student Work 2 Examining Student Work Explore looking at student work.